The U.S. Department of Housing & Urban Development (HUD) in Washington, D.C. has upgraded its Brooke-Mondale Auditorium with Vista Systems’ Spyder image processor supporting a Christie MicroTiles videowall. The Brooke-Mondale Auditorium holds about 300 people for webcasts, large training sessions, town halls and meetings with HUD Secretary Shaun Donovan. It previously featured a video projection system for speaker support. A technology solutions company with many customers in the government and military sectors, OMNITEC provides managed services for HUD. The company maintains a 14-person team to run the day-to-day audiovisual, event and video production operations for the agency. OMNITEC also converted the entire HUD broadcast and audiovisual facilities from standard definition to full 1080i HD/SDI processing. 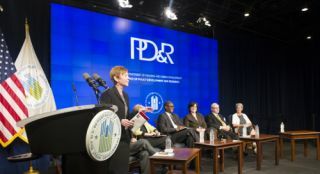 The upgraded auditorium has already hosted several town halls, the Secretary’s Awards for Exceptional Service ceremony, and an 80th anniversary celebration for HUD’s FHA division. For the latter event the Spyder showcased an anniversary video and the FHA’s new logo – “Spyder really made it pop on the MicroTiles,” Amos recalls.